Followed by a Treehouse Live stream of upcoming games. 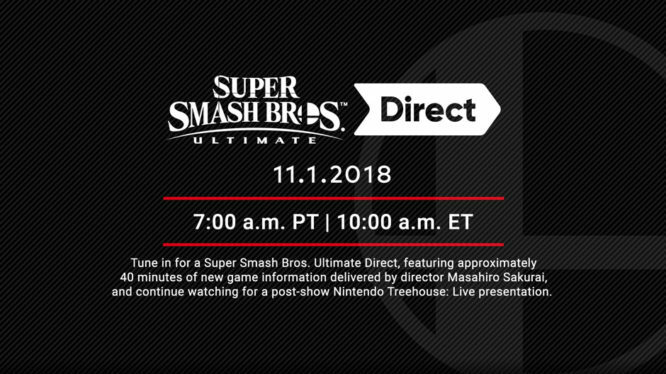 Nintendo has also stated that Masahiro Sakurai, the Director behind the Smash Bros franchise, will be acting as the Direct’s host and that fans can expect to see some more footage in the Treehouse Live stream that will follow shortly afterwards. It won’t just be Smash Bros in the Treehouse stream though, viewers will also be able to check out gameplay from a variety of other upcoming titles. The special Treehouse presentation will also include Diablo III: Eternal Edition, Pokémon: Let’s Go, and Yoshi’s Crafted World. While plenty of information has already been revealed about Super Smash Bros. Ultimate, there is clearly more to be announced. We’re still waiting to hear about the mysterious game mode uncovered in August’s Smash Bros Direct footage and there are still more fighters and stages yet to be revealed. What better time and place to showcase them all than a final Smash Direct. If your a fan of the Smash Bros franchise then don’t forget to check this one out. Nintendo accidentally reveals that Stage Builder mode is returning.